How many words can you write in a day? Today, I am attempting to move from 37,025 to 50,000 words. 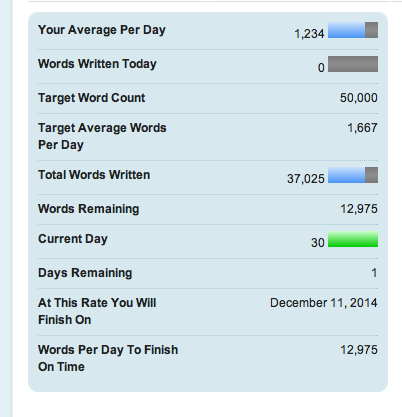 That means I have a 12,975 word goal for the next 15 hours. Well, a little less. I haven’t uploaded anything today yet but trust me, it’s way less than 12K. Update: At 9:55 a.m. I am at 38,065 words and writing. 2nd Update: 11:36 a.m. Finally cracked 40K words. Still writing. 3rd Update: 3:05 p.m. 42,226 words done. 7,774 words to go. Need another break. Last update for the night: 10:02 p.m. 47,504 words, 2,500 words to go. Catch me tomorrow to see if I beat the clock! I can do it! I know I can. But it also means I can only spare a few words here.